ArgentumInvoice is an open source web application for managing projects easily and billing the time worked accordingly. It enables you to define clients, create projects and add tickets (things to be done) for that project. The time worked for a ticket can be calculated with the help of a live timer or mentioned manually. Also, it is possible to create timesheets for every user. Today, we are listing The Five Best Online Diagramming Tools. These would be very helpful for you to create professional looking diagrams, such as flowcharts, sitemaps, organisation charts, wireframes, and many more. If you are designer, developer, office worker, manager, supervisor, student, home user, etc but we hope that these are worth checking for all of you. Most of them are not very well known but they are really amazing in respect to their features. Just take a look at them and share your thoughts here. DrawAnywhere is an online diagramming website, where you can draw, modify and share flowcharts and other diagrams, with the look & feel of a desktop application. It runs on any browser with Flash 9 installed. There is no need to download and install any custom software. It runs entirely on the web, and thus it is an always-on-access-anywhere solution. 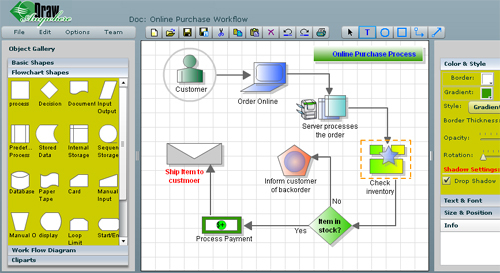 It meets all your diagramming needs without installing, maintaining and purchasing expensive software. 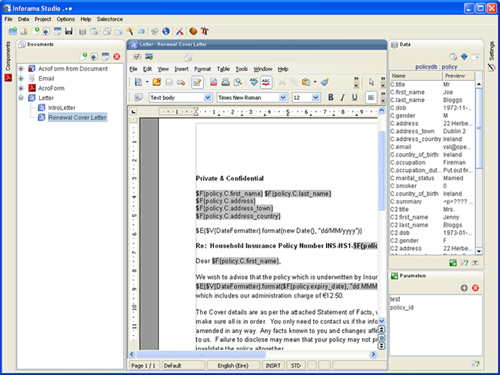 Inforama is a Java based Document Automation system which allows document templates to be created quickly and easily using OpenOffice. Templates are populated with data from parameters, databases and other data sources before being generated into PDFs for printing and emailing. Invoicera saves your time and helps you manage your bills in a snapshot. It is designed as a payment tracking application that helps you keep a track of your customer payments. For knowing the instant sending and receiving invoices process, just take one Invoicera tour, and call yourself a pro in handling this application. This is best for freelancers like attorneys/lawyers, consultants, web developers, etc; for enterprises and businesses of all nature and size; for service providers that include computer & IT services, web hosting, etc. and practically for anyone that needs to send invoices. There are thousands of web template catalogs on the Internet but none propose a way to bring a personal touch. doTemplate is different. doTemplate is a web template builder. It offers a range of website themes you can personalize online before downloading. You can use this easy template creator for free. If you use this designer tool, You can change your title, your slogan, choose the fonts… You may also upload your own banner image or choose it from our image library. You can apply fading effect, change the opacity. The result is a fully personalized and profesionnal looking banner making your website unique.